Lolo Creek - Paddler James Black. There is now an online, real-time gauge for Lolo Creek. Previously, a series of stick gauges were used, and it was often difficult to obtain up to date, and accurate flow information. Many boaters still refer to old feet readings when describing the condition of the river. American Whitewater lists min and max flows of 250 and 500 cfs, but it does frequently get run at higher flows. Lolo Creek has an early run-off, with peak flows are around the 3rd week of April. It can run into June with a big snow pack, and it can flash with major rain events in early Spring and late Winter. Lolo Creek is a highly commiting, 15-mile, class IV+ run through a deep, roadless canyon. The rapids are long, technical and difficult to portage. Wood is a serious hazard, and shifts around frequently. 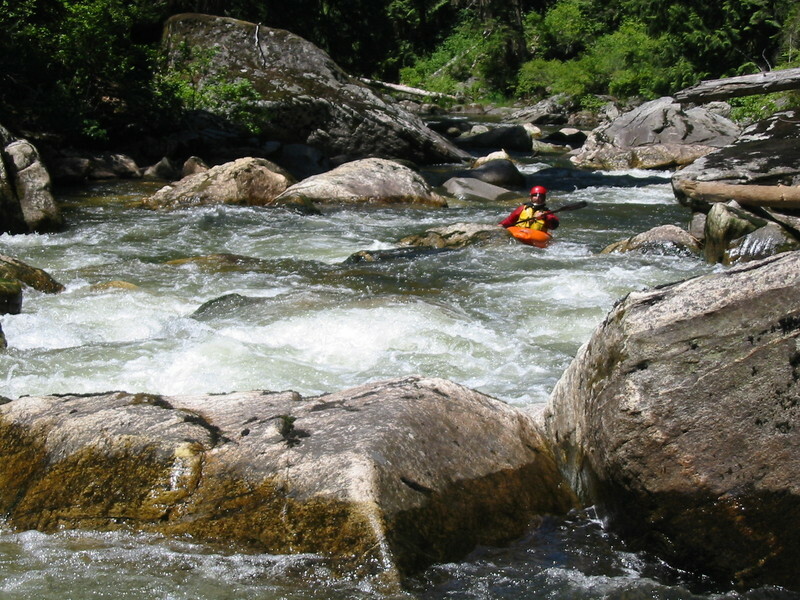 The run is best suited to those with solid class IV / V creeking experience. The first major rapid is YMCA, located a few miles down stream. If you find it intimidating, get out of your boat and hike back out to the put in. From here down things get much more difficult. The other major drops are Zig Zag, Lame Duck, Little Schmidt, Big Schmidt and Landslide. The take out is near the town of Greer. Take Hiway 12 to Hiway 11, and turn off about a mile up Hiway 11 onto Lower Lolo Creek Road. Continue till the road crosses Lolo Creek. There is a small spur road just before the bridge with better access and parking. To get to the put in, return to Hiway 11, and continue up the grade towards Weippe. A few miles before Weippe, watch for 3 Mile Road on the right. Take it and continue till you come to Lolo Creek Road on the right. Stay on Lolo Creek road to the canyon bottom, where it crosses the creek at the put in. See inset map for details.